uesday, the old cardboard shipping box with UPS tracking labels left outside Sarah Tanner’s door by the building manager came from Florida. Masking tape fortified the torn edges and black-marker blotted out the original California wine company logo and on the top were coffee-stained partial circles from coffee-cup rims. She briefly worried the box might be a threat; she was afraid of everything lately after her divorce. She cut the carelessly applied transparent tape that sealed the top; she folded back the flaps. She rummaged items from a camping trip: a backpack, water bottles, a toilet kit, extra hiking socks. Every item evoked memories of her fervent, secret affair with Peter Musconi more than twenty-five years ago. In the bottom of the box was a business envelope with no markings, the flap sealed with Scotch tape. She opened it. A white-gold engagement ring dropped to the floor. A faceted diamond, perfect color, no inclusions, and more than a carat, glittered rare value. Pristine without blemishes. She picked it up, clutched it in her hand. It’s how she remembered the perfection of her affair with Peter Musconi. Pristine. She’d never seen this ring before but knew it was meant for her. Their love for each other had been interrupted by the suddenness and immediacy of the breakup; Peter believed she’d been unfaithful … unfounded, but circumstantial evidence delivered in rumor and innuendo had convinced him otherwise. She sat and put her head back on the armless metal kitchen chair to stare at the blistered paint on the ceiling. Almost everything about Peter, his kindness, his caring, returned to her with edged clarity. And the longing resurfaced … began to consume her again. Tears blurred her vision. It was easier to ignore Peter when she was still dutifully caring for her husband Carl and her daughter Carmen. But Carl, a surgeon ready to retire, lived alone after the divorce in his three-room apartment, and Carmen was a medical student in training and lived near the hospital. The quiet of this post-divorce rented apartment now irritated her. She turned on a radio near the sink. She sat again and leaned forward resting her forehead on her arms. Many minutes passed before she reached for the phone to call the name, Richard Conway, on the return label on the box. She needed to believe Peter still cared. That he hadn’t forgotten. That she had misjudged him. “There was an expensive ring,” she ventured. “Would you ask him about the ring?” she asked. “Near Sarasota,” he said. He reluctantly looked up the address. “Goodbye,” he said abruptly. 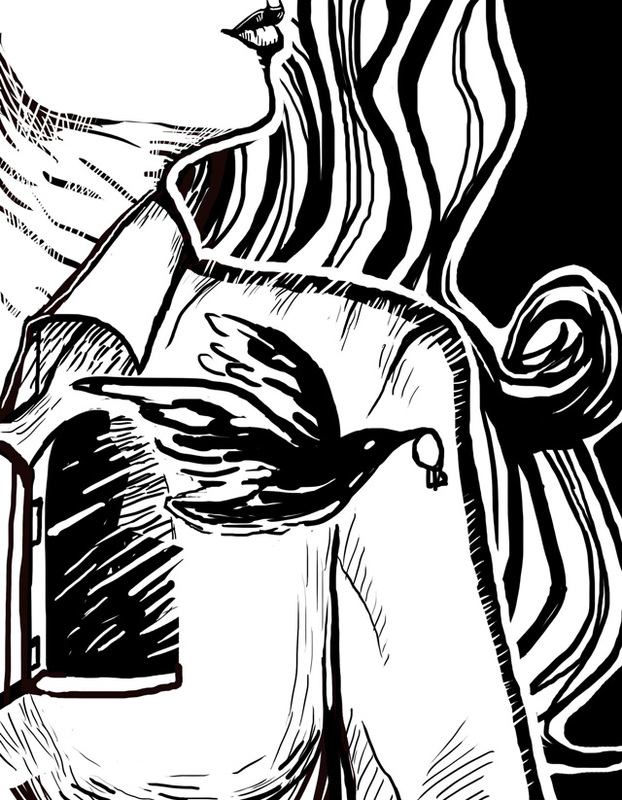 In the morning she chose her white blouse, black skirt and matching jacket, to attend the evening faculty meeting after work without having to come home to change. Later that night, she had to meet daughter Carmen. A rumor circulated that Carmen was dating a man her father’s age, the Chairman of Psychiatry at the University where Sarah worked as a scientist. Hospital and school policies prohibited faculty dating students. The policy prevented favoritism that might result in costly legal action. If Carmen persisted, scandal could strangle her career, and her lover’s. Sarah was afraid to intervene, afraid to risk the last of her barely existent parental control. But Carmen no longer accepted her father’s calls, and her father had insisted Sarah talk to Carmen—he was angry and frustrated with Carmen’s denials, irate at her irrational behavior. After faculty meeting, Sarah took a cab to Carmen’s apartment. Carmen was not home so Sarah dined at a Deli alone and then let herself in to wait. Finally, just before midnight, Carmen arrived and immediately expressed resentment of her mother’s unwelcome visit; Carmen obviously suspected Sarah’s purpose and delayed their talk with hyperactivity and silence, finally spending many minutes behind the closed bathroom door. Sarah waited anxiously, sitting cross-legged on a throw rug, proud at sixty-one she could bend like a teenager. Carmen emerged from the bathroom in pajamas and a robe and settled into a place on the love seat. The lights were off. Carmen preferred the dim light that seeped through the window from the street with a half drawn shade. Sarah asked about Carmen’s rotation at the hospital. Carmen did not respond–her face barely visible–perched on the love seat, her left leg up, her right foot positioned to relieve chronic pain she had from a congenital deformity of the lower spine. Sarah never suppressed her worry about the imperfection, even though she’d been told by many she was blameless, that some handed-down gene or some accident during the pregnancy was not responsible. Carmen gasped with pain and changed position. “Can I get you a pillow?” Sarah asked. Below the window shade a dim glow from a neon bank-sign across the street outlined shapes in the room, but did not throw shadows. Icy rain pelted the windows. The joint tip between Carmen’s thumb and forefinger glowed as she inhaled. “We’re in love.” Carmen said. “Married professors can’t love students,” Sarah said. It’s crazy, Sarah didn’t say. You’re blinded by lust for an older man that is attracted to your youth. There is no permanency in that. You’re doomed to pain and humiliation. “I think you’re making a serious mistake,” she said. I know more about love than you’ll ever know, Sarah thought thinking of her memories of Peter Musconi, but said nothing. What she had with Peter was beautiful, spoiled by the misunderstanding that shattered a joy of caring. It was love so special, so electric and binding between two human beings that Carmen could never know. But Sarah could not tell Carmen now. Carmen would dispute every word, and another argument with Carmen would only again accent Sarah’s failure as a mother. Carmen rolled to one side to ease the pain of her standing. “I’m going to bed,” Carmen said. “I’ll sleep here till morning,” Sarah said, moving to the love seat. Sarah could not sleep. With time, Carmen’s crack about Sarah knowing nothing about love hurt Sarah more than she would have expected. But why allow Carmen the satisfaction of irritating her at will? Look at the facts. Carmen hadn’t developed life skills Sarah had hoped. Oh, she loved Carmen and worried for her, but Carmen was not a superstar in anything. Of course she was pretty enough, being young helped her, and her deformity was barely noticeable. But she was consistently cranky and insecure, smart but not brilliant, demanding but never giving. And she had no parental respect … none. Well, Sarah reasoned, I gave so much more than most mothers. She was definitely not responsible for Carmen’s mediocrity–that Sarah ultimately blamed on Carl. He really wanted a boy. Sarah saw the disappointment in his face after the delivery. At first, he was kind and attentive to Carmen, and loyal … even if humorless. But as Carmen got older and lost her daddy’s cute-little-girl routine, he ignored her. He spoke in platitudes and reprimands, chipping away her already thin veneer of confidence. Dawn came. Sarah sat up and put her bare feet on the floor. She would go see Peter. He was dying. She wanted to believe his package was a signal of his longing for her over these years, longing she hoped equaled her own. She wanted to know her never fading passion, although suppressed by time, marriage, and motherhood, was not just a memory of what might have happened. She was unconcerned with pretenses now. She’d been desperately lonely for years. If Carmen knew about Peter, saw him, saw the source of Sarah’s intensity, caring, hoping, and longing … Carmen would know why love lost had ossified Sarah’s heart, forever trapping the marrow of feeling inside. It was not Sarah’s fault. But it had dried up any caring they as a family might have had for each other in the early years. One of Sarah’s PhD colleagues knew a spine clinic near where Peter was hospitalized. Sarah made an appointment and insisted Carmen go. They would have three days together. Carmen resisted by reflex, but her pain had turned worse with winter and she liked the idea of warm Florida where she could get pills her internist would no longer prescribe, and take medically-related personal days off from her student duties at the hospital. The next day Sarah went to Carmen’s apartment and they took a cab to La Guardia. A freezing rain iced the wipers and visibility was not good. Carmen undid her wool coat in the heat of the cab. Sarah thought Carmen looked attractive in a cochineal red dress, the hemline above her knees to show her thin, only slightly defined legs, which gave her a little girl look. Sarah understood how a middle-aged man could be attracted to Carmen’s youthful skin and naturally blond hair. “Who’s this friend?” Carmen asked as if this was the first time she’d thought of it. Sarah wanted to blurt the joy of her good memories about Peter. Tell her the crescendo of sharing and caring she had never forgotten. Carmen gazed out the window. Sarah wanted to tell her what she and Peter had talked about–beauty, fulfillment, shared values. How the sound of his breathing in the dark aroused her. She wanted to explain how an ardent suitor she never liked or encouraged in any way had lied to Peter to convince him she was unfaithful. “Is your pain any better today?” she asked Carmen. “It doesn’t change,” Carmen said without looking at her. When Sarah asked her about her pathology rotation, Carmen shrugged. Sarah said little else. Their delayed flight arrived in Florida four hours late. The motel front desk had already shut down. They rang a bell for the sleepy attendant. After the visit to the specialist, Sarah took Carmen with her to the hospital. Peter’s family was not there; they rarely came, the nurse said. Sarah and Carmen looked down at Peter. His breath rattled in the opening of the tracheotomy tube in his neck. Monitors at the bedside gave uncoordinated beeps for vital functions. “He’s not conscious,” Carmen said. Carmen’s authoritative medical-student speech irritated Sarah. “Let’s go,” Carmen added. “In a minute,” Sarah said sharply. This is Peter, she wanted to say, the first man she gave herself to … with passion and warmth and caring she never experienced again. Do you think you’re strong enough to carry that with you for a lifetime, my little Carmen? The joy of being loved? Sarah held Peter’s coarse, dry-skinned hand in hers. Tears filled her eyes. Carmen turned away and went to sit on an armless chair near the door. Carmen saw no love. She saw sentimentality and it embarrassed her. Disgusting, really. The sentimentality. Bringing Carmen was an enormous mistake. Carmen would never understand; she could never perceive the reality across twenty-five years of time with Peter unable to communicate. Sarah remained quiet for many minutes as Carmen read a magazine. Sarah slowly became aware of Peter’s presence. Then there was tension in his hand, an attempt to communicate. One time she thought his head turned a fraction of an inch toward her. She squeezed his hand gently. She knew he squeezed back. Carmen never knew. “Why did you break up?” Carmen asked. It was what Sarah had wanted. An interest in the past from Carmen. But now it seemed insincere. “That is so male,” Carmen said with disdain. “He was hurt. We both were.” She felt Peter’s hand tighten again. “His pressure is dropping,” Carmen said as she stared at a green-line monitor. Sarah thought through his closed eyelids Peter tried to look at her. “His pulse is irregular,” Carmen said. “I don’t see it.” It’s probably on the floor. “Please go!” Sarah no longer wanted Carmen in the room. Carmen’s crass aloofness seemed cruel. She wished again she had never brought her. As the door closed, the tension in Peter’s hand increased. She thought he might have smiled. The pulse monitor alarm went off. In a few seconds a nurse rushed in. Carmen had not returned. There was so much Sarah needed to explain; she felt life leaving when Peter’s body tensed ever so slightly in waves that must have been more imagined than real, like a breeze caressing a flag, then the flag drooping motionless. Sarah waited, hoping for more time with Peter, but resuscitation routines were useless. Sarah took Carmen to the airport that evening. With Peter’s death, she needed desperately to tell Carmen every detail of her love for him. Sarah wanted to probe the loss she was suffering. How love could lapse so irreversibly into grief. But Carmen talked continually about her pain and her doctor’s appointment, allowing no time for conversation, as if she dreaded words from her mother, any words. In a motel room, Sarah waited alone for the funeral, lying on the bed with little sleep day or night, eating crackers and drinking sodas she collected from the vending machine down the hall. Three days later she attended the brief service at the funeral parlor. The youngest son had come to oversee arrangements. “Who are you?” the son said. Sarah gave him a questioning look. She could see a likeness to Peter, and grief escalated. He looked away. He had demons he was hiding, but she could only guess what they might be. She wondered if he loved his father. She doubted he loved anyone. “He was a wonderful man,” she said reflexively. She looked away. “What would you know?” he said without turning. “I knew him well,” she said testily. She looked away from the son, from the casket, out an open door to an alley. “No one ever knew him.” He laughed without humor and walked away. He had no consolation for her; he had no grief to compare. A minister, who did not seem to have known Peter or the family, said prayers. The son gave a short, remote, insecure eulogy to the thirteen people who attended. She could imagine Carmen reluctantly giving the same empty words for her. She left before the reception started. Waiting to board a flight to return home, Sarah sat at gate A32 next to a gray haired woman in a print dress with wire-framed bifocal glasses and swollen feet in black low-heeled shoes. She clutched her bag on her lap. Sarah, when she closed her eyes, saw the redundant details of Peter’s dying parade before her. She needed to talk about him, about them. In death he deserved to be known for the good man he was. Someone needed to know. To know the source of her misery. “You don’t like flying?” Sarah said. “I flew down to see a friend who died …” Sarah began. “Did you come far?” the woman asked. She talked loudly as if she might be hard of hearing. The overhead announcement told standbys there were no seats available. The woman heard this and opened her purse and looked at her boarding pass. She replaced it. “He was cremated,” Sarah said. “That’s the way now. Isn’t it?” the woman said. “But not for me. I want to be whole for the second coming.” The woman shook her head as if affirming cremation was a serious mistake. Then she stood pointing to a light green tote bag. “Would you watch that?” the woman said. She headed toward the restrooms. Sarah waited until the woman returned before joining her group that was in the process of boarding. Her aisle seat was on a two-seat row; in the window seat a tall black youth with a reversed-bill baseball cap sat with his knees angled into her space. She slipped down into the seat. He said nothing. Peter’s open-coffin was on her mind, his lifeless look so inhuman that the passing of his life seemed even more acute. The plane leveled off at cruising altitude. The youth ate a banana he pulled out of his pocket, put the skin in the seat-back pocket in front of him. “You like bananas?” Sarah asked. He looked at her as if to tell her to go away, and then he ignored her. He seemed intent on ignoring her. “You play basketball?” she asked. The youth looked at her guardedly. He nodded. The boy turned his head to stare out the window. The boy twisted in his seat. He waved to a passing attendant. “You got a pillow?” he called out. “I’ll see,” the attendant said, beginning to open overhead bins. “Are you tired from a game?” Sarah asked. The attendant returned with a pillow. The youth tucked it under his head turning away and closing his eyes. Sarah extracted an in-flight magazine from the seat pocket in front of her and methodically turned the pages without reading. The youth was asleep and breathing deeply when the snacks were served; in her seat pocket, Sarah saved three packets of peanuts for him to eat when he woke. At home, Sarah believed Peter waited to die until she arrived at his bedside. She removed the box from her closet, put it on the kitchen table, and removed items, pausing to stare at each one before she stuffed them back into the box and carried it to the trash shoot at the end of the hall. It was bulky and stuck in the opening and she had to push with her arm almost up to her shoulder into the main drop. When it fell, she felt no different. She had hoped for finality, a sense of a house burned to the ground and then moving on to a new life in a new place. But nothing changed. When she returned she checked the kitchen drawer to be sure the ring was still there. The next morning she was up earlier than usual to dress and leave. The night had been turbulent with indecision but before dawn she knew she must tell Carmen it was best to follow her heart. Carmen must not suffer from recoiled love. If Carmen loves, she must love as much as she possibly can and never squelch love for fear of love fading. Of course there will be dangers Sarah could never mention. Carmen wouldn’t listen anyway. But Carmen must know, a tethered heart is never freed, and swells with an oppressive sensitivity that becomes ever-present. Sarah would say no more, except she would sell the ring to help pay this semester’s tuition. Outside the apartment building, as she was about to hail a cab, the homeless man who lived in the neighborhood called to her. He was wedged into the right angle where the building wall met the street. “You got anything for today?” he said grinning, his eyes looking up. He looked content, like a baby about to burp. A neighbor had fed him. He waved to a woman passing, a stranger. “Hey … you. Spare a little something for a homeless vet?” The woman ignored him. Sarah kept an eye to the street. Cabs were sparse today. “I don’t think he ever knew …” she began hesitantly. The derelict wiped his mouth with his frayed sleeve. His eyes closed, his head nodded. She sat beside him on the street, her back to the wall. She wanted her words to come out now. She did not believe he really heard her tell him about Peter, about the missed opportunity of a life vibrant with love. But she spoke with intensity from the heart as if he knew every meaning. And when it was over, she slumped … her mind soothed, her emotions quieted … before forcing herself to stand. When she hailed a taxi, he awoke. “You have a good day, my dear,” he said raising a limp hand. She tucked a twenty-dollar bill into his jacket pocket as the taxi pulled up to the curb.